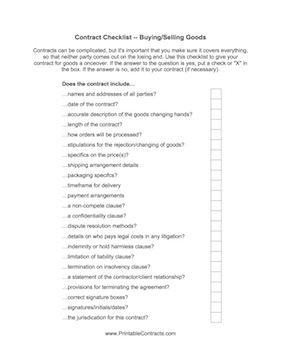 Use this Goods Contract Checklist to help you make sure you have covered all the bases in any contract to buy or sell goods. Contracts can be complicated, but it's important that you make sure it covers everything, so that neither party comes out on the losing end. Use this checklist to give your contract for goods a once-over. If the answer to the question is yes, put a check or "X" in the box. If the answer is no, add it to your contract (if necessary). --names and addresses of all parties? --accurate description of the goods changing hands? --how orders will be processed? --stipulations for the rejection/changing of goods? --details on who pays legal costs in any litigation? --indemnity or hold harmless clause? --a statement of the contractor/client relationship? --provisions for terminating the agreement? --the jurisdiction for this contract?